The ultimate weekend getaway, Vacation Rental property, or permanent residence awaits in this fabulous condo in desirable Crescent Beach! Situated directly between the Atlantic Ocean and Intracoastal Waterway, there is a deeded beach access across the street, and county maintained boat ramp at the end of the road. Condo is being sold partially furnished: leather sofa, dining table, 2 twin headboards/beds and nightstand. Peeks of Intracoastal from Master bedroom and patio! 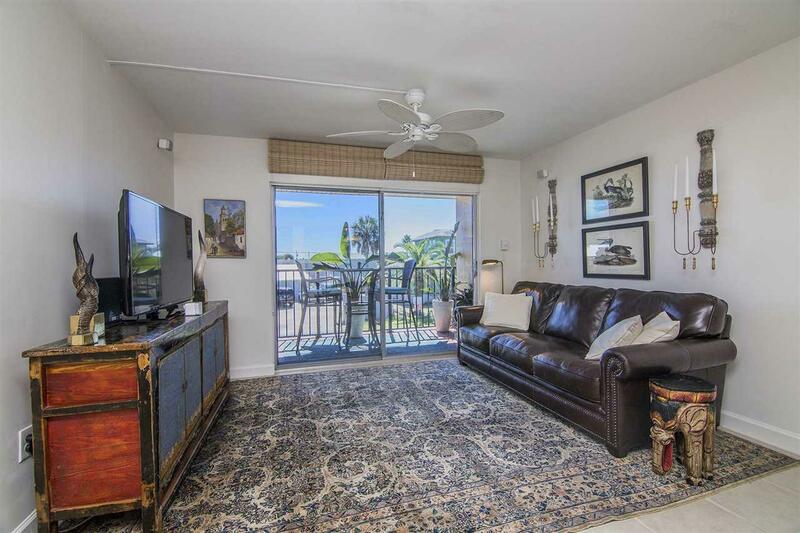 This second-story 2 BR/ 2 BA condo has been meticulously maintained by the owners, is move-in ready and, of course, HIGH & DRY! Many recent renovations including: fresh paint throughout, popcorn ceilings have been removed, and new ceiling fan in Living Room and second Bedroom. With a new A/C installed in 2015, and new custom Plantation blinds in bedrooms, this condo is extremely energy efficient! Front and storm doors are both new. New Sisal carpet installed in bedrooms, and tile in kitchen, living area, and bathrooms make perfect floor coverings for beach living! (Grout has recently been professionally cleaned and sealed). New baseboards throughout, as well as trim around windows. Closet kits have been added in both bedroom closets, and storage shelves have been added in utility room to maximize storage space. Like new GE washer & dryers. Bathrooms have been beautifully renovated, with new Bath Fitter showers installed. Electrical wiring in unit has been updated, including new outlets. Speaker wire has been installed in Master Bedroom, Master Bathroom, and on the patio. Flatscreen TV on the wall in Master bedroom has been professionally hung and wired with HDMI, and will remain in unit. Kick back and relax on the patio, and listen to your favorite tunes while you watch the sun set! Boat/kayak storage free for residents. Listing courtesy of Watson Realty Corp (A1a). © 2019 St. Augustine & St. Johns County Board of Realtors. IDX information is provided exclusively for consumers' personal, non-commercial use and may not be used for any purpose other than to identify prospective properties consumers may be interested in purchasing. Information is believed to be accurate but not guaranteed by the MLS or 97Park. Data last updated 2019-04-23T15:30:42.093. © 2019 Northeast Florida Multiple Listing Service, Inc. All rights reserved. The data relating to real estate for sale on this web site comes in part from the Internet Data Exchange (IDX) program of the Northeast Florida Multiple Listing Service, Inc. Real estate listings held by brokerage firms other than 97Park are marked with the listing broker’s name and detailed information about such listings includes the name of the listing brokers. Data provided is deemed reliable but is not guaranteed. Data last updated 2019-04-23T15:24:18.87.